Every ambitious school wants to be known for students who have confident, well-rounded personalities and score well on exams. But while we talk about scoring well, are tests the only way of assessing a child’s progress? Also, is a high average exam score an indicator of a better performing school? While most of the tests that schools conduct only cover the first and third parts of an effective assessment, only a few cover the second. But a majority of assessment methods completely ignore that a student’s assessment is reflective of the teaching methods in class, must provide an evidence of conceptual understanding as well as its application, and is a means to motivate a child to work on areas of improvement. Student assessment doesn’t just indicate how well a child is doing at studies. If used well, it gives qualitative insights into the effectiveness of teaching and learning methodology followed by schools. A successful framework of assessment would also encourage teachers, students and parents to look at the future of the child and focus on developing contemporary and relevant skill sets. Follow a structured approach to lessons: One can only assess if a child has met a learning objective if the Aim of a lesson/project/activity has been clearly communicated between the student and teacher. Begin every lesson with a clear aim which states the one key takeaway every child will have at the end of the 35 minute period. Actively use a verb to define this objective, and create this aim so as to develop one key skill beside conceptual development. Fig. 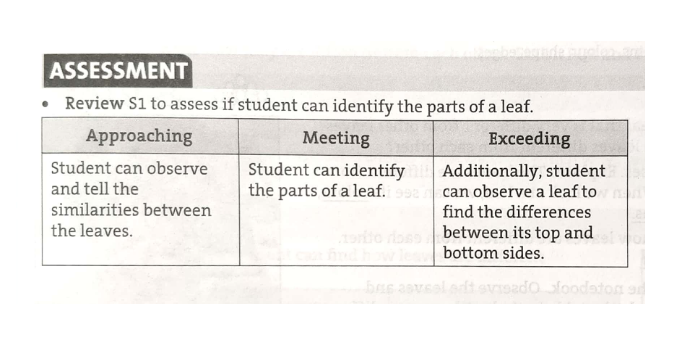 1 gives an example of an aim that clearly communicates that by the end of a 35-minute class, a student who is able to identify the different parts of a leaf is successful. Once set, a class must be completely centered on achieving this learning objective with questions, activities and group discussions. Include Application-based and Higher Order Thinking questions: Education in the 21st century cannot be limited to re-writing memorized answers in exams. It is essential that a child doesn’t just know the concept but is able to apply it to solve real-life problems. It is also important that a child is able to develop original thought and be able to articulate his/her interpretation effectively. Application-based and Higher Order Thinking questions measure a child’s level of understanding and the ability to apply those concepts in the context of an unknown situation. Utilize Rubrics for evaluation: A rubric is a multidimensional scoring guideline that aims to develop and maintain consistency in evaluation. While most tests only measure a child’s understanding of a concept, a rubric defines the level of this understanding as well as the level of skill development while learning the said concept. 21st century is all about rounded individuals. Formats of competitive exams are changing to include skill assessment, problem-solving abilities, analytical thinking and creativity. These skills need to be introduced to a child early in his/her education. A rubric helps assess just that. Fig. 2 shows a rubric corresponding to the aim discussed in the first point. It clearly gives the teacher visibility into whether the child is approaching, meeting or exceeding the learning expectation – in terms of conceptual understanding and skill development – set by the Aim of the class. Complete the Feedback: Very often schools fail to realize the importance of feedback and just convey the assessment results. Communicating the performance and areas of improvement is as much essential as measuring the performance. Feedback should clearly layout what are the strengths of the student and which areas need improvement. Also, a clear improvement plan should be provided to each student on “how to improve” in areas in which student is struggling. Majority of students are there who just need a bit of guidance to leapfrog to the next level of performance and confidence.